Poor Andrew Robert Rector. 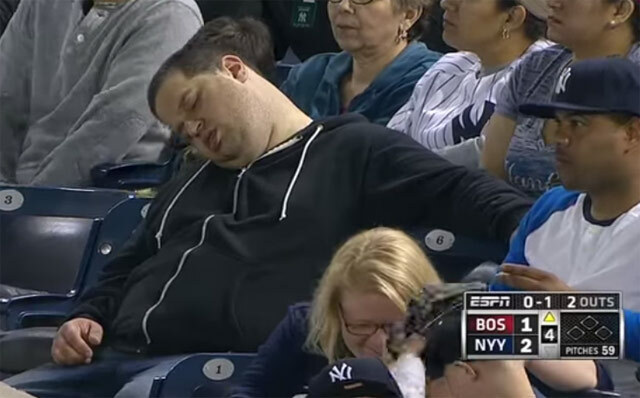 He got busted on camera taking a snooze during a New York Yankees game against the Boston Red Sox back in April. He’s not the first person who’s slept at a ballgame nor will he be the last. I confess to having dozed off at the stadium once or twice. Hey, between the hot afternoon sun and a couple of beers, it’s easy to close my eyes and drift away. However, Mr Rector claims it was much more than that. He’s suing Major League Baseball Advanced Media, ESPN New York, the New York Yankees, as well as ESPN announcers, Dan Shulman and John Kruk and wants $10 million in damages for “defamation and intentional infliction of emotional distress”. “Plaintiff is unintelligent and stupid individual. “Plaintiff is not worthy to be fan of the New York Yankee. “Plaintiff is a fatty cow that need two seats at all time and represent symbol of failure. “Plaintiff is a confused disgusted and socially bankrupt individual. “Plaintiff is confused individual that neither understands nor knows anything about history and the meaning of rivalry between Red Sox and New York Yankee. Those are some truly awful things to say about a person. Except that, in this video, Dan Shulman and John Kruk say none of it. The worst of it, in my opinion, was when they joked about the “buddy” not wanting to share his chicken fingers and they may very well have still said it if Rector were slender. Otherwise nothing could be interpreted as fat shaming or referring to him as “stupid”. What the announcers are more guilty of is not asking stadium security to check on Rector and make sure he was indeed napping and not passed out or otherwise ill. He certainly didn’t look comfortable. The Yankees, the participating club, the commissioner of Major League Baseball and the other event promoter and each of their respective agents and licensees shall have the unrestricted right and license to use the holders likeness in any broadcast, telecast, film, audio/video recording or photograph taken in connection with the game or other event or other transmission or reproduction, in whole or in part, of the game or other event. Yes, people have been subjected to on-air or online ridicule over their size, whether thin or fat, and it should never be tolerated. However, unless another video surfaces to prove Rector’s allegations, I have to believe that this is a case of “the boy who cried wolf” or “the man who cried fat shaming”, looking for a pay day because he got caught napping. True, it’s embarrassing but hardly worth a $10 million settlement or even $10.